If your sink is leaking or if it’s clogged, you can have a real mess very quickly. There are ways to fix these issues, but if the issues persist, make sure to call a professional plumber. The toilet is something you never really notice until it doesn’t work. And then it’s a big deal. Here’s what you need to know. 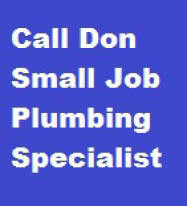 A good plumber is the key to solving a toilet issue, but if you don’t have one handy, you can try to fix it on your own. You’ve sprung a leak in your house. Don’t panic, we’ve got you covered with these simple tips and tricks for some of the most common ones.